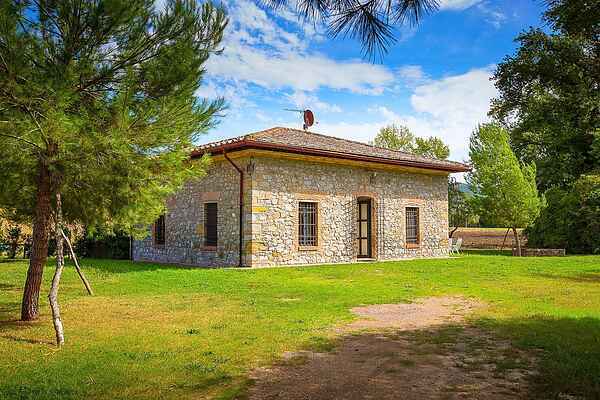 Casa la Provincia is between the two picturesque Tuscan hamlets of Sassa and Canneto. The house is near a quiet road and enjoys good views of the hills. The holiday home consists of two buildings. The annex has a bedroom and a bathroom. The home owner is an enthusiastic collector of antique furniture. This is apparent from the impressive way the house is furnished. The holiday home is spacious and very well kept. It is ideally positioned for visiting historic Volterra, San Gimignano, Siena, Pisa and Lucca. It is also perfect for touring the beautiful, undulating Tuscan landscape. You can also enjoy a day at one of the attractive seaside resorts. For cultural visits, we have some tips for you; The wonderful Querceto Castle is located about 5 km away. In addition, the beautiful city of Volterra is at 15 km but also small Etruscan, Roman, Medieval villages: Montegemoli, La Sassa, Monteverdi, Canneto, Guardistallo Montescudaio, Casale Marittimo are all within 4 to 6 km away. The most prestigious wines in the world are to be found at 20 km in the Bolgheri area, but also Canneto, Tenuta Casale Marittimo have class wines and olive oil with certifications and awards on national level. Many good restaurants in the neighborhood as "Il Ghiotto" and the excellent pizzeria in the village of Canneto. For seafood you must go to sea: Marina di Cecina - Bibbona - Marina di Castagneto all have good restaurants. You can play golf at "Camping Le Capanne" and "La California" in Bibbona. For horse lovers, there are several options in Cecina Mare, Rosignano and Vada.